The Dr. Bronner’s Magic Pure Castile Peppermint Soap is a highly rated, all-purpose soap. Magic soap? This must be a marketing gimmick. That’s what I thought at first as well. After all, what can be magical about a soap? Well, this peppermint pure Castile soap will mesmerize you. Dr. Bronner’s Magic pure Castile peppermint soap is all-purpose. It has a very refreshing peppermint scent. Made from organic peppermint oil. Not some artificial ingredient. You can use this pure Castile peppermint soap to wash your hair, scrub your body, clean your face. Grab the 100% post-consumer recycled bottle, and bring it to the kitchen. Wash your dishes with it. Gentle on your hands and the environment. Proceed to use this and clean your apartment. It is truly all-in-one. 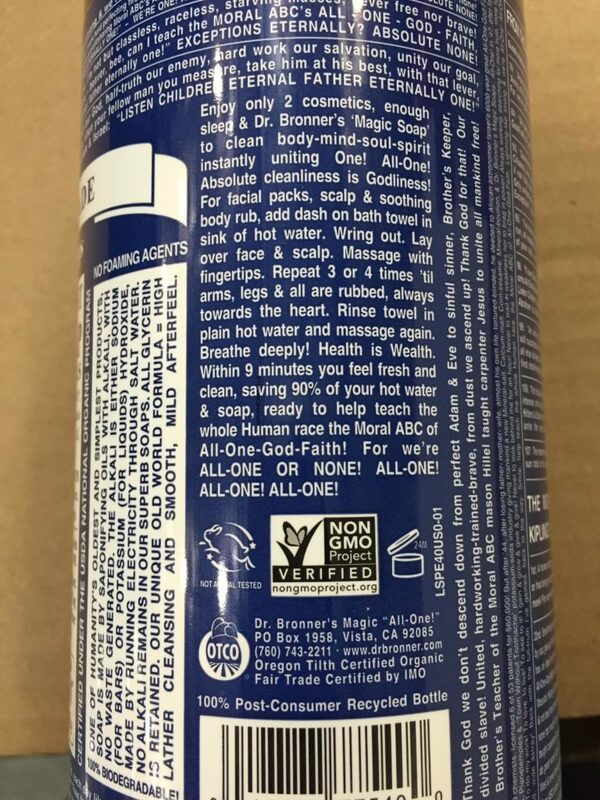 If you look at the ingredients list below, you’ll find that Dr. Bronner added many natural oils into this peppermint soap. No long chemical names that you don’t understand. 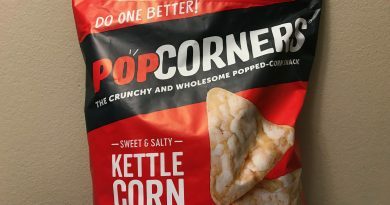 Made with non-GMO ingredients and some organic oils. 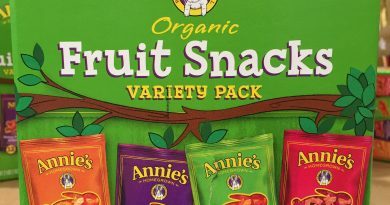 Many of the ingredients are also certified free trade. You can’t go wrong with this unique soap product. There are no detergents. No harsh chemicals. No pollution. Protect the health for those around you. And be natural and gentle to your hands! 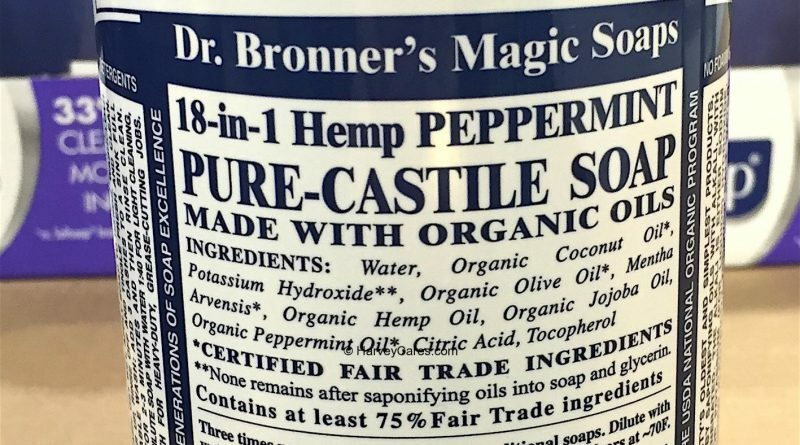 Is Dr. Bronner’s Magic pure Castile peppermint soap magical? That is up to you to decide. Looking to Purchase Dr. Bronner’s Magic Pure Castile Peppermint Soap? Shopping for the Best Magic Soap Products? The Dr. Bronner’s Magic Pure Castile Peppermint Soap is wonderful. Back to the good stuff! Take a look at the detailed review of Dr. Bronner’s Magic Pure Castile Peppermint Soap below. Item name: Dr. Bronner’s Magic Pure Castile Peppermint Soap. Ingredients: Water. Organic coconut oil. Potassium hydroxide. Organic olive oil. Mentha arvensis. Organic hemp oil. Organic jojoba oil. Organic peppermint oil. Citric acid. Tocopherol. Many of the oils used in this pure-castile soap are certified fair trade ingredients. In fact, Dr. Bronner’s Magic Pure Castile Peppermint Soap contains at least 75% fair trade ingredients. The soap formula is 3 times more concentrated than traditional soaps. Dilute with water. Dr. Bronner’s castile peppermint soap is truly magical. How so? You can use the magic pure castile peppermint soap on almost everything. Wash your dishes with it. Use it as a body wash. Lather it up and wash your hair. Clean your home with it. The uses are endless. One thing is clear though. It is an effective soap. And beloved by many. Dr. Bronner’s Magic Pure Castile Peppermint Soap is the top rated soap product on Amazon.com. This magic soap commands thousands of five star reviews. And it’s not a mystery why it is so. Many of the ingredients in Dr. Bronner’s peppermint soap are certified free trade. 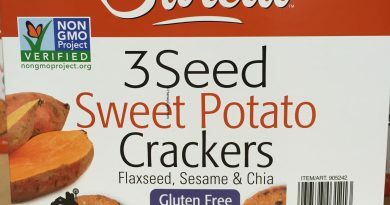 It is also a non-GMO product. If you studied the ingredients list on the top, you will see that instead of a long list of chemical names, this magic all-purpose soap actually consists of many different oils. No more flushing harsh chemicals down the drain and causing more pollution. The soap is also naturally easy on the hands too. And easy on the health of those around you. There are no detergents. Just natural oils and other ingredients. For a multi-purpose clean. Everything and anything. That, I think, is the powerful of Dr. Brooner. And perhaps where the magic lies too. 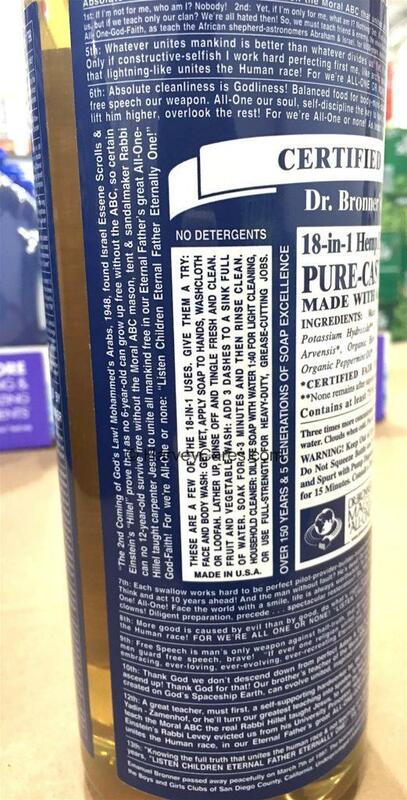 Below, you can find the usage instructions for Dr. Bronner’s Magic pure castile peppermint soap. You can use this magic peppermint soap on your face. Massage your scalp with this refreshing peppermint scent. Sooth your body by rubbing it while you take a shower. Or dilute and dap a bit of the pure Castile soap onto your bath towel. 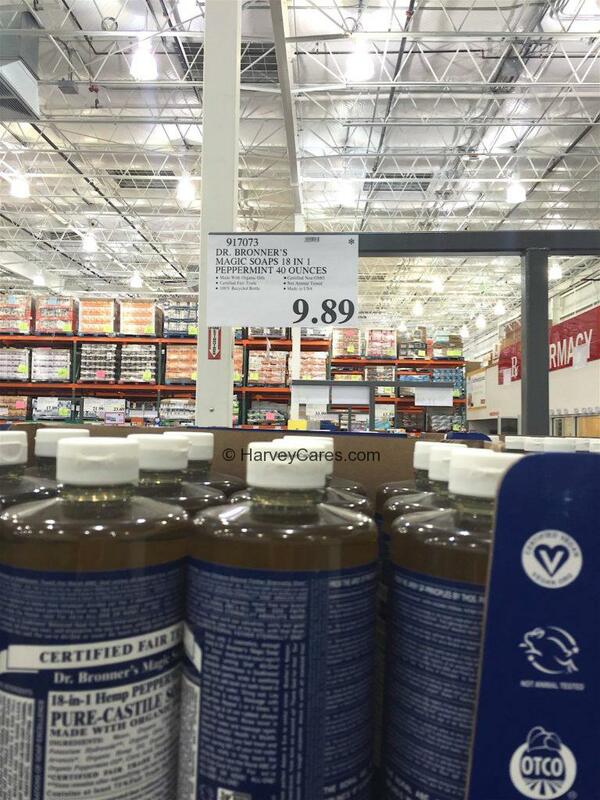 The Dr. Bronner’s Magic Pure Castile Peppermint Soap is currently selling at my local Costco Warehouse for $9.89. Amazon.com appears to have the best price for this item with shipping included. There are also different scent options available. 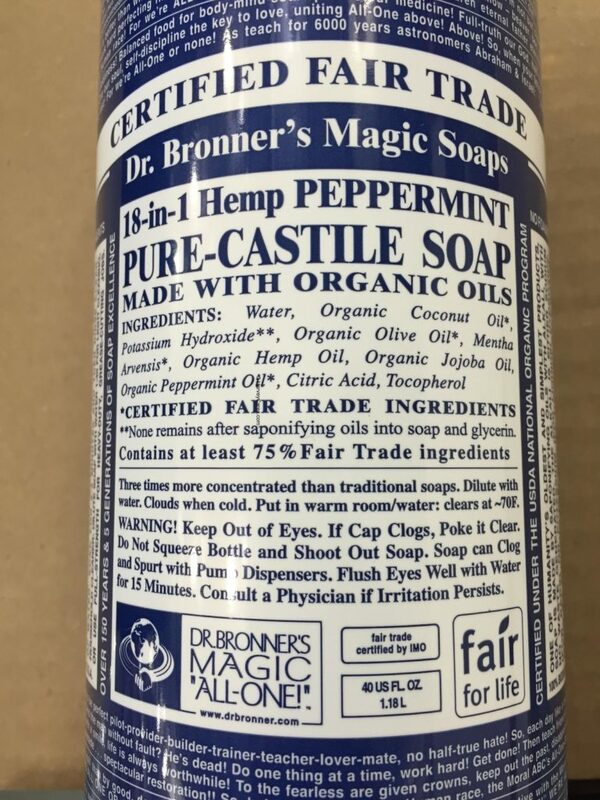 Have you bought the Dr. Bronner’s Magic Pure Castile Peppermint Soap before?